Slow Cooker Honey Cinnamon Carrots…these crock pot carrots are a sweet, buttery, addictive side dish for freeing up the oven on a holiday or any day! I’m sure I don’t need to tell you that slow cookers just make life easier. Sometimes they mean that dinner is ready when you are, without the 5:00 what-the-heck-am-I-going-to-make dilemma or the hectic evening cooking rush. 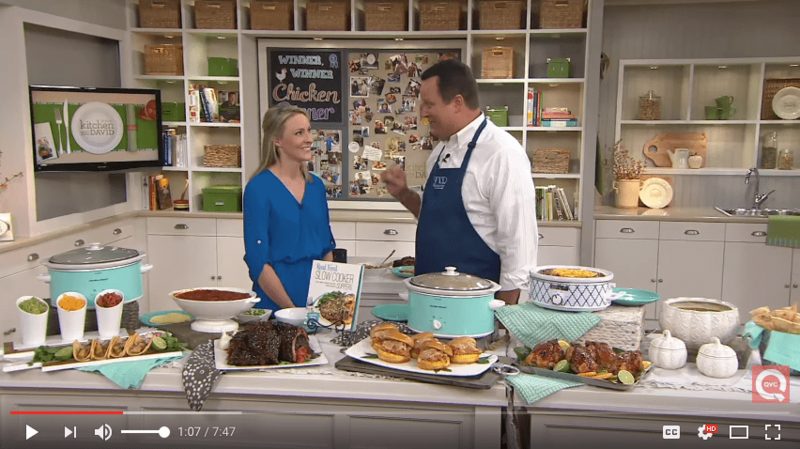 Other times, slow cookers equal salvation when holiday menu completion has you short on oven space and stove top real estate. 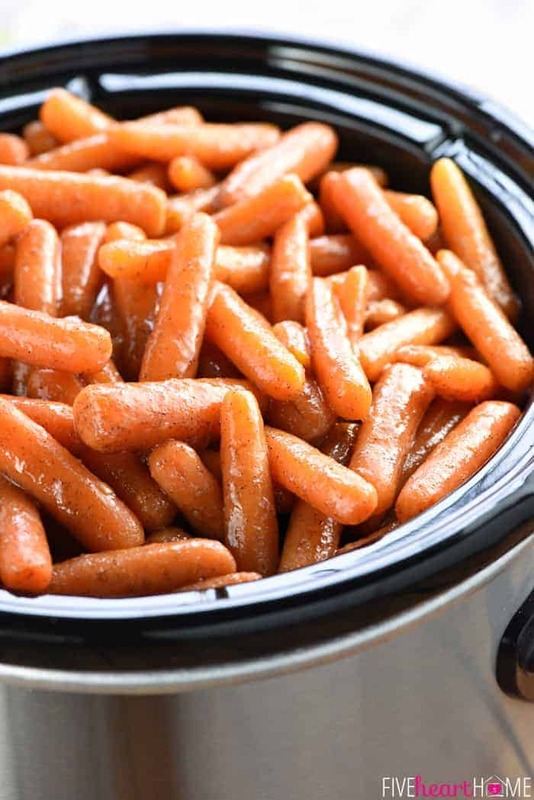 The latter case is where these Slow Cooker Honey Cinnamon Carrots come in. Have you heard that Easter is right around the corner? Well, my friends, these sweet and glossy little beauties would make the perfect accompaniment to ham. Their cinnamon-kissed honey butter glaze makes them not only delectable, but addictive. We may as well just refer to them as carrot candy from here on out, y’all. 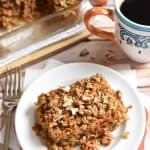 The combination of honey and cinnamon always reminds me of a sopapilla, yet cinnamon gives carrots an almost sweet potato casserole or pumpkin pie-like quality. So guess what that means? 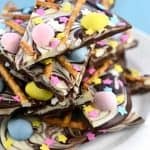 This recipe is not limited to Easter. 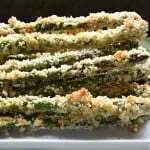 It would also be a popular accompaniment to Thanksgiving or Christmas dinner. For that matter, this is not simply a holiday recipe! I have no doubt that your family would be thrilled to pile their plates with some Slow Cooker Honey Cinnamon Carrots on any ol’ Tuesday. After the carrots are tender, golden honey is stirred in, along with cinnamon and a bit of pure vanilla extract. These combine with the butter to create a glorious glaze. From there, you can just set your slow cooker to WARM until mealtime. Gently stir the carrots before serving, and don’t forget an extra drizzle of glaze over your plated carrots, because cinnamonhoneybutterYUM. Speaking of stirring, I feel the need to quickly explain the photos accompanying this post. 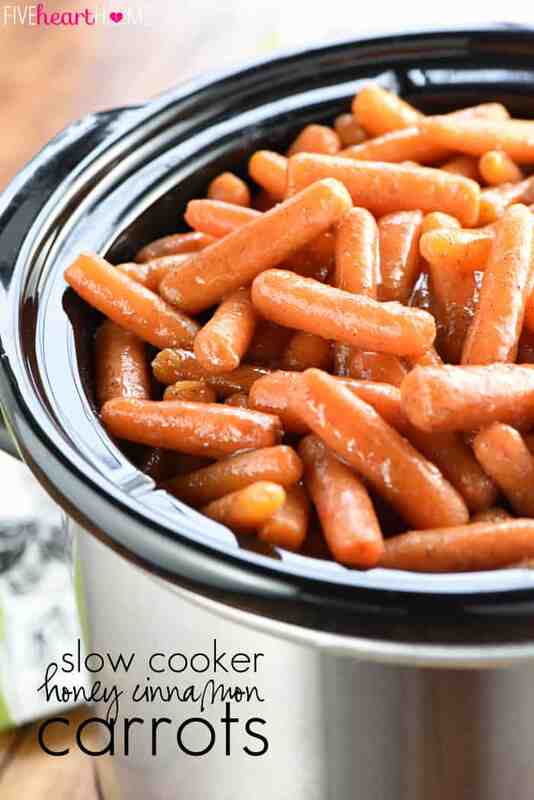 I actually cooked my carrots in a large, oval, 6-quart slow cooker. I only transferred them to this smaller, 3-quart slow cooker for photography purposes, because the carrots were down at the bottom of the larger slow cooker and it was hard to take pictures with all of those shadows. While the carrots would have easily fit in my smaller slow cooker, I preferred cooking them in my larger model because it gave me room to carefully stir them after adding the honey. By that point, of course, the carrots were soft and tender, and a small, crowded slow cooker could have resulted in them becoming inadvertently chopped up while trying to incorporate the sticky honey with a spoon. I probably wouldn’t have cared about slightly mutilated carrots if we were just going to be eating them, but again, blog photos. It’s really up to you as to what size slow cooker to use, but I think the carrots are a bit easier to stir in a larger one. So it’s decided. 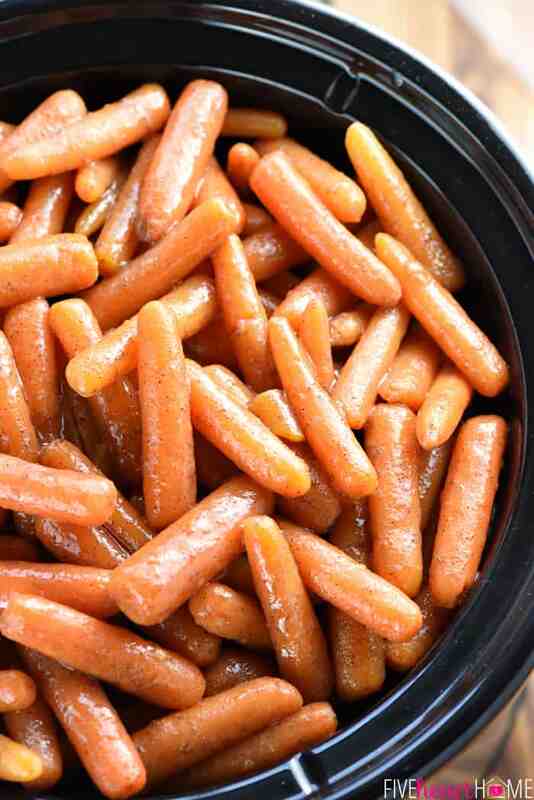 You’ll be serving Slow Cooker Honey Cinnamon Carrots for Easter! And Thanksgiving. Probably Christmas. And likely half a dozen more times in between. Because, really…who doesn’t love a side dish that makes itself? 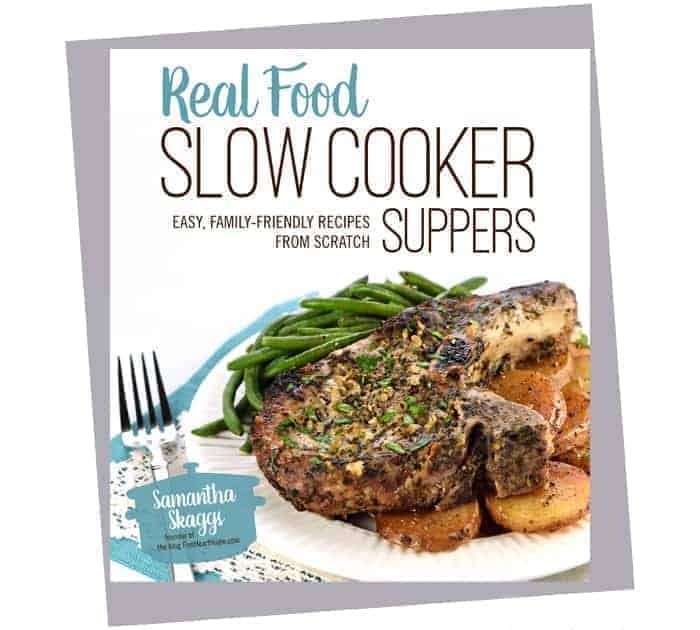 In case you’re in the market for a new slow cooker, here’s my favorite one. Adding 1 tablespoon bourbon does not make these crock pot carrots taste like whiskey. However, feel free to stir in additional bourbon if you’d like a stronger, more noticeable flavor. See how easy it is to make this recipe in the below video! Slow Cooker Honey Cinnamon Carrots make a sweet, buttery, and addictive side dish...the perfect easy recipe for freeing up the oven and feeding a crowd, on a holiday or any day! 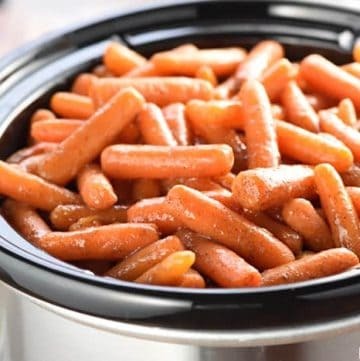 Place carrots in the bottom of a slow cooker (I used a 6-quart...choose a size that's large enough to allow room for stirring). Stir salt and bourbon into the melted butter. Pour over the carrots in the slow cooker and toss until evenly coated. Cover and cook for 6 to 8 hours on LOW (or 3 to 4 hours on HIGH) until carrots are tender. 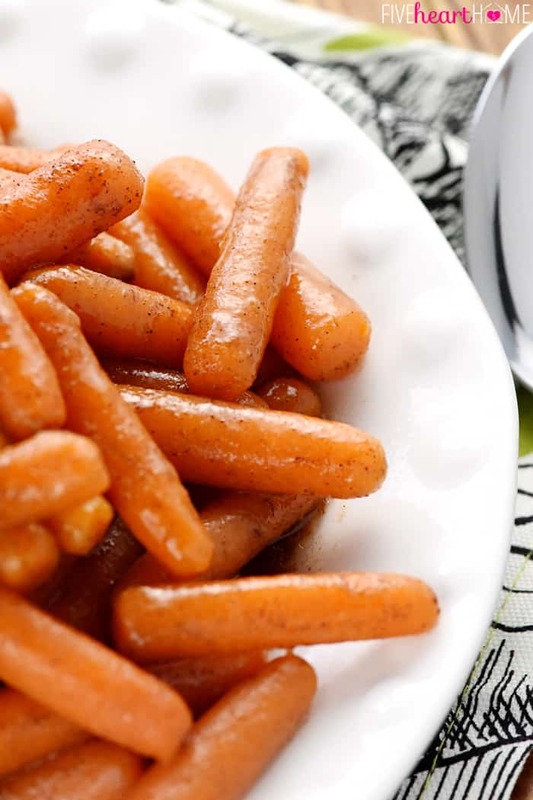 Drizzle cooked carrots with honey and vanilla and sprinkle with cinnamon. Gently stir until carrots are evenly coated with butter/honey/cinnamon mixture. Set slow cooker to WARM until ready to serve and stir well before stirring. Adding 1 tablespoon bourbon does not make these carrots taste like whiskey. However, feel free to stir in additional bourbon if you'd like a stronger, more noticeable flavor. Post originally published on March 10, 2016. 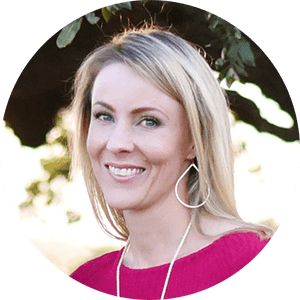 What can you use instead of bourbon? Hi Julia! You can just leave out the bourbon altogether. 🙂 Or, if you wish, you could swap it out for something citrus-y like orange juice. Enjoy! I bet substituting Grand Marnier would be bomb dot com. What could you use instead of butter? These baby carrots look so beautiful. The ingredients are easy to get and definitely something different to try with carrots. 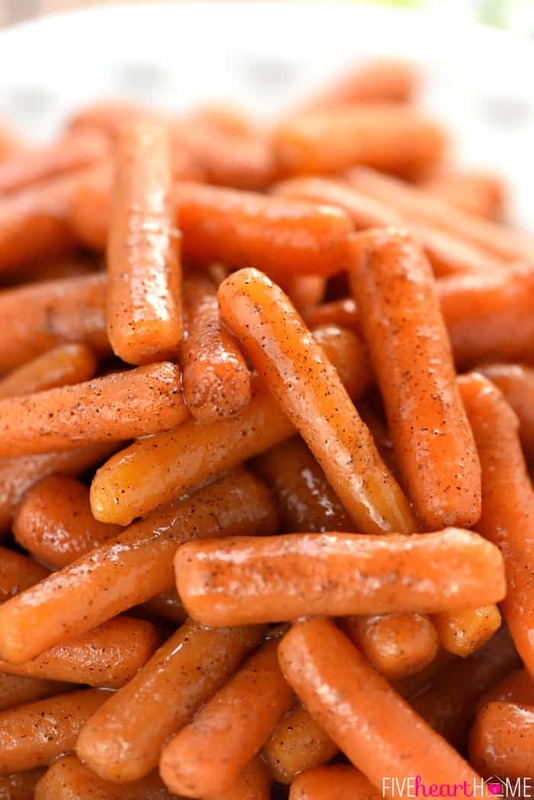 Cinnamon carrots are such a great idea for Easter dinner! Can’t wait to have these on my table! 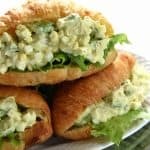 I can’t tell you how much my kids LOVED this recipe! !